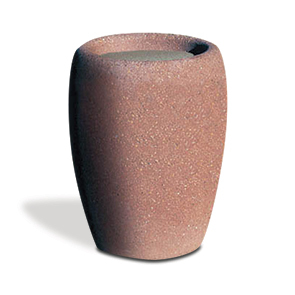 Commercial grade outdoor concrete ashtrays are naturally strong and reliable, providing unwavering service. The round planter inspired outdoor ashtray features a 12" basin for smokers to properly snuff and dispose of cigarette butts. Fill the 4" deep ashtray base with sand to assist in the proper suffocation of any lit material, preventing contents from blowing out of the ashtray. Made with ASTM compliant rebar reinforced precast concrete and available in a fine selection of standard and premium finishes.